What surprises me about the Iranian Homeland Theory is that it doesn't state any cultural, linguistic or archaeological evidence, nor any candidate cultural horizon as Early Proto Indo-Europeans. That vagueness makes it almost un-falsifiable. Say what you will about OM, at least he produced a scenario that was verifiable. Same thing with the OIT fans, who claim the original PIE culture is IVC. The MPI-SHH theory however stays clear from any substantial claim. I'm not sure David Reich & friends buy into the Iran thing either. They probably stand by it publically because it beecause it is the only theory that puts Steppe genesis into a schema that connects it with other ancient populations and sounds cool. "Iranian farmers moved into Steppe and India", is nice and simple and is really interesting. Eventually, as more ancient DNA is collected from the Caucasus and Steppe, David Reich & friends will change their stance from Iranian farmers to ancient Caucasian people. @epoch, it would be nice if so. But is there even enough knowledge of the succession of neolithic cultures in the Caucasus-Iran for them to begin to do that? Russian archaeology is pretty good, for the region and the cultures. Is the comparable archaeology for this region in as good shape? "The attestation of Anatolian Indo-European personal names in 25th century BCE " (at Ebla in Syria) "decisively falsifies the Yamnaya culture as a possible archaeological horizon for PIE-speakers prior to the Anatolian Indo-European split. The period of Proto-Anatolian linguistic unity can now be placed in the 4th millennium BCE and may have been contemporaneous with e.g. the Maykop culture (3700–3000 BCE), which influenced the formation and apparent westward migration of the Yamnaya and maintained commercial and cultural contact with the Anatolian highlands (Kristiansen et al. 2018). Our findings corroborate the Indo-Anatolian Hypothesis, which claims that Anatolian Indo-European split off from Proto-Indo-European first and that Anatolian Indo-European represents a sister rather than a daughter language. Our findings call for the identification of the speakers of Proto-Indo-Anatolian as a population earlier that the Yamnaya and late Maykop cultures." since the onomastic evidence from Armi is contemporaneous with the Yamnaya culture (3000–2400 BCE), a scenario in which the Anatolian Indo-European language was linguistically derived from Indo-European speakers originating in this culture can be rejected. This important result offers new support for the Indo-Hittite Hypothesis (see above) and strengthens the case for an Indo-Hittite-speaking ancestral population from which both Proto-Anatolian and residual Proto-Indo-European split off no later than the 4th millennium BCE. There is also certainly some work needed on the steppe side to reformulate the hypothesis in a way that provides an archaeological horizon for movements from the steppe into the Near East from pre-Yamnaya groups, and that probably does not include cultural features dated to the Yamnaya horizon as part of the reconstructed Indo-Hittite lexicon (though they could be the proto-Indo-European sister). The "Revised Steppe Theory" centered on Yamnaya seems out, and some form of steppe theory based on migrations of earlier cultures, with a much less developed pastoral economy seems to now be necessary to maintain an Indo-Hittite steppe origin theory of some sort. Marija Gimbutas moved away from an original theory of the Yamnaya as nucleus for the proto language to a theory where the spread of the proto language was connected to a horizon around the spread of "Kurgan culture" from the Pontic-Caspian steppe... but that's considered nonsense now, because of the vagueness of definition, and because of the grab bag character of the "horizon". Globular Amphora Culture, Maykop, Remedello, Baden culture all were included as "kurganized" and certainly seem to lack any notable EHG ancestry when we look at the genotype through adna today. (This kind of fast and loose characterisation of material culture also being characteristic of her work around the figurines of the Balkan Cultures; ascribing to and deriving from them a whole female-centric mythology and society which it is overwhelmingly likely did not exist). So although steppe still seems the best (from a genetic and probably linguistic angle), there is a gap for a steppe theory that actually shows an archaeological horizon consistent with the above name evidence. "this will have to be done with the assumption in mind that Yamnaya and Corded Ware became Indo-European-speaking almost purely via an linguistic transmission, with hardly any associated gene flow. It's possible, I guess." CHG and some mtDNA tends to indicate that brides from the Caucasus were brought into Steppe communities, consistent with strong patrilocality and a strong tendency to bring in non-local brides and non-steppe brides in Indo-European communities elsewhere, e.g., in Corded Ware culture. Now, the anthropology evidence tends to show pretty strong that when a bride who doesn't speak her husband's language is brought to her husband's home and community, that their children end up speaking the husband's language and not the wife's. For example, the literature on linguistic exogamy supports this conclusion. So, this isn't a really strong argument for a means of language transmission from the Caucasus. But, if you had a lot of Caucasian brides in the community, you would expect PIE to pick up loan words, large adult language learner community tweaks to its grammar (generally a linguistically simplifying force), and possible other phonetic and grammatical influences similar to a linguistic substrate influence - because language learning wives customary mistakes in learning PIE driven by their own shared L1 tendencies would have some impact on PIE as a whole if there were a lot of them at once. "But then there's almost 200 years of scholarship based on linguistics and archaeological data that generally agrees in favor of the Pontic-Caspian steppe as the PIE homeland." The linguistic data could be more definitive on this point (it has really been the genetics that have tipped the balance decisively in favor of the Pontic-Caspian steppe over, for example, an Anatolian Neolithic theory). Vocabulary based analysis of inferred PIE and early Rig Vedic Sanskrit suggests, for example, mountain and forest vocabulary that seems to rich to ascribe to a steppe environment or to India. The archaeological data is probably the strongest argument that Caucasian cultures like Maykop and Kura-Araxes was a powerful cultural source for Indo-Europeans on the Steppe. These Caucasian sources were pretty much definitively the source of the metallurgical technologies that gave the Bronze Age steppe people one of their decisive advantages over late Neolithic cultures and Copper Age cultures that lacked these technologies, and there is increasing evidence that funeral practices very similar to those that became litmus tests of Indo-European steppe cultures arose contemporaneously or perhaps even earlier in these Caucasian cultures which were also the source of their metallurgical technologies. And, we know that the Steppe people and the people in these Caucasian cultures exchanged goods, technologies and sent wives to the Steppe in connection with these trade exchanges. So, the archaeological data does not contradict a narrative in which some key Caucasian cultures make large cultural contributions to Steppe culture that were pivotal in the ethnogenesis of an explosively expansive PIE culture that also integrated technological advances like the domestication of horses and the wheel with Caucasian metallurgy and probably Caucasian religious ideas as well. While providing wives isn't a good means of language influence, prestige cultures with advanced cultural elements and technologies do have powerful linguistic influence on the recipients of technologies from prestige cultures, so the direction of technology transfer and cultural transfer mostly from the Caucasus to the Steppe does provide conditions well suited to linguistic transmission in the same direction. The key point in these scenarios, however, is that regardless of the ultimate source of contributors to the PIE mixing pot, there is a secondary expansion from the Pontic-Caspian steppe speaking late PIE in any case. '... when a bride who doesn't speak her husband's language is brought to her husband's home and community, that their children end up speaking the husband's language and not the wife's.' True enough, as the father's lingo is the avenue to everything that is merited within the social context. But mind the 'ends up'! Such a child will be bilingual as the language intuitions that are formed in very early childhood will have derived from the mother! But there seems to be a lot of hitches along this scenario. Linguistic ones mostly. There's a knot here not quite untangled. Most IE scholars don't consider the Yamnnaya culture to be the ancestor of Anatolian IE in any case, most place the ancestor of all IE languages in the Sredny Stog era. So I don't think it's much of a big deal that the Yamanya=PIE hypothesis is possibly falsified. Gimbutas and Mallory place PIE in Sredny Stog. 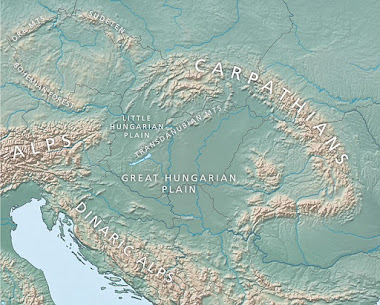 Anthony focuses on Yamnaya but specifically states that incursions into the Danube area by earlier PIE speakers in the 5th millennium may have given rise to Anatolian. Parpola says PIE is in Cucuteni Tripolye, and that Sredny Stog pastoralists immigrated and took over in the 5th millennium and these immigrants became the PIE speakers. The pendulum may have swung towards Yamnaya after the genetic studies came out that connected the Yamnaya Steppe component to IE cultures, but we now know that this component is older than Yamnaya and the archaeological theories always pointed earlier as well. ""The attestation of Anatolian Indo-European personal names in 25th century BCE " (at Ebla in Syria) "decisively falsifies the Yamnaya culture as a possible archaeological horizon for PIE-speakers prior to the Anatolian Indo-European split." Whomever is being quoted is greatly overstating the strength of that linguistic evidence, which amounts to twenty proper names in a Syrian collection of records, in a context where Hattic proper names and Hittite proper names are not actually very different at all. "The attestation of Anatolian Indo-European personal names in 25th century BCE "(at Ebla in Syria)" decisively falsifies the Yamnaya culture as a possible archaeological horizon for PIE-speakers prior to the Anatolian Indo-European split." Bit of a straw man, no? Because who's actually arguing that Yamnaya was archaic PIE? Is there any significance at all in fairly strong Indian matches turning up occasionally in the Gedmatch results of individuals of purely European ancestry? Is it evidence of ancient shared Steppe descent, or is it merely an erroneous artifact of the Gedmatch algorithim? Some proponents of the Steppe hypothesis propose this: Sredni-Stog -> Novodanilovka -> Suvorovo -> Ezero -> Anatolians. Mathieson 2018 actually supports this, as it may have no Suvorovo (+/- 4400 BC) samples but it has a sample from the culture that immediately preceded it with steppe ancestry and it has a contemporary sample from an area just a 100 km west of the Suvorovo sample which has Y-DNA R1 and steppe ancestry. Ezero has steppe ancestry. Oddly enough Mathieson claims his paper makes a route through the Balkans less probable where I think it actually points to crucial evidence for it. I think David Anthony stated that Suvorovo presented the oldest tumuli. They weren't on the steppe though. I don't know much about the IBD algorithm at GEdmatch, so I can't comment about that. But yeah, IBD tests pick up a lot of ancient ancestry, so you need to look for large segments (>10 cM), or clusters of smaller segments, to focus on more recent ancestry. But even then, if the algorithm is a bit crap, you have to be very cautious how you interpret the output. "The attestation of Anatolian Indo-European personal names in 25th century BCE " (at Ebla in Syria) "decisively falsifies the Yamnaya culture as a possible archaeological horizon for PIE-speakers prior to the Anatolian Indo-European split." In fact, it's in Ebla's tablets, but the names (around 20) are found in relation to Armi, not Ebla. The result is still needing peer-review. As a matter of fact, this result is based on various hypothesis, it is depending on how you are transcripting the tablets. You must understand that the words are not writing in full, but like in Hebrew, only certains letters are written, and some parts of the words are omitted (like in Latin). So, given the very limited number of examples, and the numerous possibilities of reading the same word (which is written in another language than Eblaic), we must be very cautious with an assimilation with Anatolian names. In fact, "the attestation of Anatolian Indo-European personal names in 25th century BCE" is only a hypothesis and remains to be proved. I think many linguists will no agree with him anyway (and from what I read, the identification with IE personnal names is only based on some radicals, so the names themselves are not fully IE in any case). Another point must be stressed: he are dating the Yamnaya horizon from 3000BC, which is an error. 3300BC is a more accurate datation, and probably postdate the real homogeneization in the Steppe. By the way, the Yamnaya Horizon datation needs some work: we need to explain the presence of Yamnaya in Thrace already around 3100BC. In fact, they are still the best candidates for being the origin of the Anatolian branch: Ezero is too early (as the IE are appearing in Anatolia in the second half of the IIId millenium), and they are vanishing almost at the same time as Anatolian IE could have entered Anatolia (XXIVth century). The Yamnaya seem to be really the key element about IE dispersal. Another point must be stressed: the CHG-like component was already present in Steppe Eneolithic. So the admixing between EHG and CHG-like is older than 4000BC, with no relation to Caucasus-Eneolithic. What happened during the IVth millenium is homogenization between Steppe groups with incorporation of european farmers groups present in the Steppe. Those groups were probably related to CT (archeologically attested in the Steppe). Synome: Most IE scholars don't consider the Yamnnaya culture to be the ancestor of Anatolian IE in any case, most place the ancestor of all IE languages in the Sredny Stog era. So I don't think it's much of a big deal that the Yamanya=PIE hypothesis is possibly falsified. That is fine, if a strong argument can be marshelled for that, which is clear and falsifiable. That they can demonstrate a clear, unambiguous material link and expansion in archaeology, or genetic ancestry (ideally both) and a linguistic reconstruction of proto-Indo-Anatolian lexicon and inferred material culture, one that does not lean heavily on the proto-Indo-European descended languages (which descend from one sister subclade so not independent data points) can be strongly linked to that archaeology. And this still turns out to be very clearly the superior of a NE Anatolia-Caucasian urheimat at the time in matching of lexicon to habitat and material culture. Mainly noting Anatolian as a late spread associated with either Yamnaya or the Steppe_MLBA cultures (e.g. Hittites as charioteers from the steppe type ideas), and then extraordinary substrate effects have made the language appear more differentiated, seems now falsified. If you take the linguistic supplement to Damgaard (lead author Kroonan) as correct, noting various objections upthread that contend it is not so (for which I'd probably have to await specific responses from linguistic consensus to defer to). That vagueness makes it almost un-falsifiable. Say what you will about OM, at least he produced a scenario that was verifiable. Same thing with the OIT fans, who claim the original PIE culture is IVC. The MPI-SHH theory however stays clear from any substantial claim. Imagine if it turns out that even Olympus Mons was more scientific than the MPI-SHH. I just finished reading D. Reich's new book. He says south of the Caucaus/Iran for proto-IE. He just drops it in at the end of a paragraph after pointing to the wheel/wagon cognates in IE. But he leaves out the biological terms that fit the Steppe and not Iran. I dunno - he's the genetics expert, and he talks with all the other experts, but it's hard for me to figure. 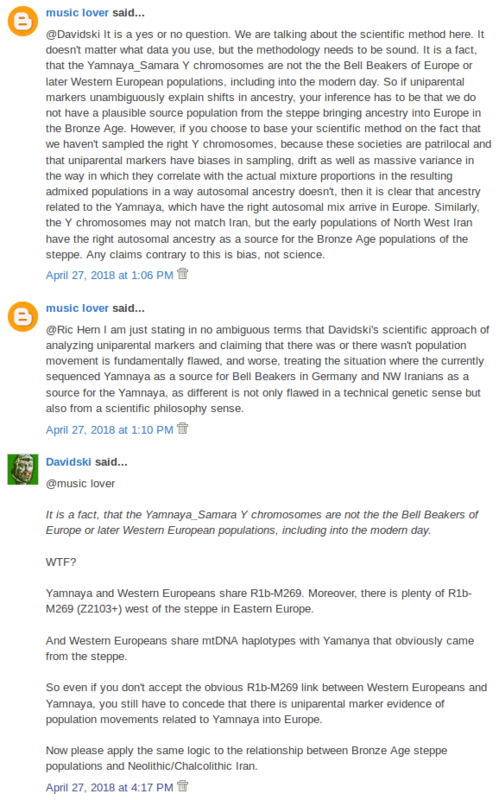 I have a (possibly stupid) question to ask: Roughly what proportion of the Yamnaya ancestry was composed of CHG people (or how much of the Yamnaya DNA comes from CHG populations). The picture has only recently begun to get clearer, thanks to excavations in the Caucasus (pipeline-related) and NW Iran (dam-building). - Late Chalcolithic (LC) 1 Pisdeli Culture, 4,500 – 4,200 BC: Part of the so-called “post-Ubaid” horizon, displaying Mesotopotamian influence and parallels to the Upper Euphrates region. - EBA Kura Araxes / Early Transcaucasian Culture (ETC), ca. 3,500-2,500 BC: Apparently intrusive, with a possible short hiatus/ chronological gap. The origin of KA is yet unclear, earliest attestation (around 4,000 BC) from the Middle Araxes (Kültepe, Arashten) as admixture into CFW-dominated contexts. In spite of the intrusive character, NW Iran still represents an early phase of KA expansion. - MLBA Urmia Ware, 2,200-1,500 BC, with strong parallels to the Trialeti Culture (E. Georgia), and contemporary Armenia and Azerbaijan. Various archeological aspects still need to be sorted out. This, of course, applies even more to linguistic considerations, which, aside from PIE, also concern Hurro-Urartian and North Caucasian. Luckily, we have quite a bit of regional aDNA already, and I invite you (and others) to check whether archeological finds correspond to information yielded by aDNA. We will probably still have to wait a few years for aDNA from Syria, but the Iraq part of Mesopotamia may sooner or later provide aDNA that can help to shed light on the nature and extent of Ubaid/ Uruk influence, possibly also on the hide-out of Basal Euasians. You point out that Yamnaya isn't intimately related to Iran_N, i.e. the Central Zagros. I trust you in that, you are far better at genetic analyses than I am. Some time ago, you also showed that Yamnaya (or the CHG/Iranian component within it) didn't directly descend from Colchian HG (CHG, Kotias, Satsurblia). So, we are apparently dealing with an ancestry component that was neither originating from Colchis, nor the Central Zagros, but somewhere in-between. But from where in-between? For answering that question, I prefer going back to the LGM and the question of LGM refugia. Colchis, and the narrow strip of Black Sea coastal lowland extending westwards towards Samsun has, for all we know, been one of those LGM refugia. We don't have UP/EP samples from the Turkish part of that refugium yet, but I doubt that they would be substantially differentiated enough from the available Colchian samples to qualify as source for the CHG part of Steppe Eneolithic ancestry. Recent climate models suggest that during the LGM, glaciation of the Caucasus reached as far down as 500m a.s.l. The fact that Satsurblia, at 360m a.s.l., was uninhabited during the LGM indicates that only lowlands qualified as LGM refugia. This puts most of E. Georgia, with the possible exception of Lower Kakheti, out. Moreover, E. Georgia today has rather low precipitation and is semi-steppic to desert-like; during the LGM, all available climate modelling suggests it to have been an uninhabitable desert. AFAIK, there hasn't been any UP/EP site identified in E. Georgia so far, in contrast to several W. Georgian sites, but also Early Paleolithic spots such as Dmanisi (arguably the earliest Hominid found outside Africa). The same seems to appöy to W. Azerbaijan. The Kura plain in E. Azerbaijan was anyway flooded during the LGM (Khvalynian Transgression) and as such uninhabitable. That essentially leaves us with the S. Caspian, evidenced as LGM refugium for, e.g., the Persian Walnut. The area has been (and is still) affected by Caspian Sea level fluctuations. During the LGM, and possibly also after the Younger Dryas, sea levels were up to 60m higher than today (Hotu cave, e.g., was flooded during the UP and only settled during the Mesolithic). OTOH, during interstadials, the sea level may have been more than 100m lower than today, reducing the Caspian Sea to the size of the Aral Lake (at it's better times, pre-1970s) and opening up wide coastal plains to the North and South. Against this background, the chance of getting South Caspian UP/EP aDNA seems comparable to obtaining aDNA from Doggerland, i.e. close to zero. Hotu_HG apparently already displays substantial introgression from the Central Zagros. The same may apply to nearby Bell Cave, which has hardly been discussed and analysed so far. Still, the South Caspian UP/EP looks as the most parsimonious source of "CHG-Iranian, but neither Colchian nor Zagros" contribution to Steppe populations. And that would ultimately make those contributors Iranian (or originating from within 200 sea miles off the Iranian coast). I wonder, btw., whether it is possible to construct an South Caspian UP ghost from Hotu_HG/ Bell Cave HG (but maybe the sample quality is too poor). Wagons were already being used by Neolithic farmers in Central Europe, so the Proto-Indo-Europeans and Yamnaya may have got this technology from the west from, say, Cucuteni Tripolye and/or Globular Amphora. Is there something special about the Maykop wagons that say Yamnaya wagons were derived from them? In any case, Yamnaya doesn't actually show a clear, unambiguous genetic relationship to Maykop, while it does harbor Globular Amophora-like ancestry. We've been talking about the latter fact for a couple of years in the comments here. I suppose that there may have been important contacts between Maykop and Yamnaya that resulted in language transfer, so this is worth discussing at least. But I wouldn't get too caught up in this, because I reckon the Maykop data, when poked and prodded enough, will eventually reveal that Maykop people were intimately related to present-day Caucasian speakers. And apart from that, the notion that Yamnaya is significantly derived from some Bronze Age or Eneolithic population from Iran isn't even worth discussing. It's just total f*cking nonsense. Hmmm? Is something being done there when it comes to Ancient DNA? 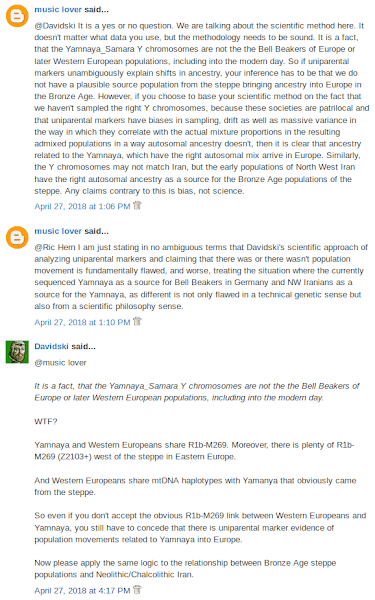 Don't get your hopes up that you'll ever see any real evidence of Ubaid/Uruk genetic influence in Yamnaya, no matter how much aDNA from Mesopotamia is recovered. How much contact did the Indo-Europeans retain after their dispersal ? Could the words for new inventions or technology have spread or be more standardized after the dispersal of Proto-Indo-Europeans ? Were there indirect contact between the Altai and the Balkans after the dispersal ? Davidski said... "Around 30-40%. Check out my qpGraph models here..."
Maybe I'm reading your graph wrong? If you are showing Steppe_Eneolithic3 as only 28% CHG and Yamnaya was a mix of Steppe_Eneolithic3 and European MN Farmer, wouldn't CHG be lower than 28%? You're correct. I was thinking of my qpAdm models when I posted that. So based on all of the evidence, from a variety of methods, CHG is probably at around 30% in Yamnaya. How much of this CHG is traceable in contemporary European populations? It's usually about a third to a half of their steppe ancestry proportion, which makes sense. To answer the question for modern Northern Europeans, this means about one quarter CHG ancestry, doesnt it? Btw, forgot to ask earlier, please share this post via all social media that you can think of. No, because for North Europens the third (of their Steppe ancestry) applies. The ones that go for the half are the ones with extra, non-Steppe, CHG(like) ancestry. Thanks for that information (link and summary) on Iran. I need information of Maternal Haplogroup R1a, you have nothing on it on Eurogenes and there is next to nothing on it on google. My mothers family are Irish, Scottish English and Belgian and I wanna know how I got this very rare haplotype. Also can you compile a list of Archaic European gnome Gedmatch kit numbers n a list for comparison please and thank you. I've been trying to upload western Neanderthal gnomes that I have downloaded from the google drive of whoever has them accessable on the Gedmatc ancient DNA page but when I do they always say they have not yet been tokenized etc even after 6-8 months. Seems odd that only the Altai Neanderthal gnome is available for comparison when Western European Neanderthals would have allot more DNA in common with both Archaic and modern Europeans you would think. Also I ran Pestera Cu Oase through the Gedmath eye color predictor and he had blue eyes which comepletely debunks the idea that blue eyes originated in the black sea area only 8-10,000 years ago as do many other samples show if run through the eye color predictor. Look forward to hearing from you, you can e-mal me at 4mypeople@protonmail.com and also check out my youtube channel 4mypeople where we discuss Archaeology ancient history and genetics mythology etc. "However, interestingly, Wang et al. did appear to try to save the link between Yamnaya and Iran by referring to the CHG-related ancestry in Yamnaya as "CHG/Iranian". I'm not surprised because most of these authors are associated with the Max Planck Institute for the Science of Human History (MPI-SHH), which is currently pushing a proposal that the Proto-Indo-European (PIE) homeland was located in what is now Iran and surrounds (see here). So, obviously, they need to somehow show a relationship between Yamnaya and Iran, because Yamnaya and the closely related Corded Ware archaeological complex are generally seen as early Indo-European cultural horizons. Good luck with that." Your assertion is completely backwards. Keep in mind the 2 CHG samples (the same ones they always use) are averaging 4000 years older than the Iranian Neolithic samples! You should be thankful the trend among scholars has been to euphamize that component, by (incorrectly) referring to it as CHG, instead of the dreaded 'Iranian'. If you look at Wangs extended analysis, indeed, made it clear the component is more Iranian than CHG. Other studies have always shown the same trend when K is higher. All of this means, of course, Yamnaya has an Iran_N component. And I have no doubt both REICH LABS AND the MAX PLANCK INSTITUTE, have solely in interest in preserving European history. Yamnaya has no ancestry from Iran. It's a mixture of Eneolithic steppe (native to the steppe) and Middle Neolithic European farmers. This should be clear even to a 12 year old when looking at the data from Wang et al.